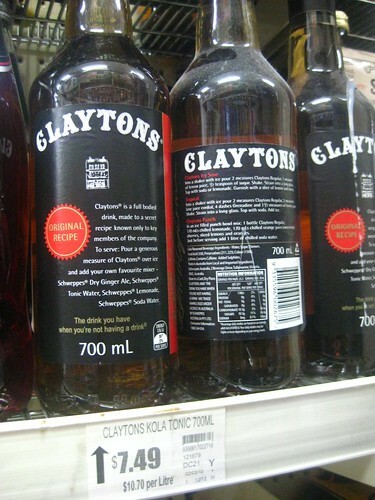 Claytons is the brand of a non-alcoholic beverage resembling whisky which originated in Australia during the 1970s and 1980s. It was promoted as "the drink you have when you're not having a drink" at a time when alcohol was being targeted because of road death tolls. Many conscientious people—including Adventists as I recall—went out and bought the drink and took it to parties. They were sort of saying, “look at me I’m cool” because they looked like a social drinker but avoided the consequences of a hangover the next day. They could blend in and not draw attention to themselves. It was safe, smart and there were no side effects. Social Justice Warriors (SJW’s) have been around since the time of Karl Marx and Luigi Taparelli but the recent rise of them inside the church displaying the same nauseating characteristics is a serious worry. The Claytons idea of looking like you are doing something while actually not doing it, is also an accurate description of this new movement within the church. Like the Claytons drinker, trying to “fit in” without serious consequences serves the same inner need. A SJW therefore, can receive positive support from their peers by going overseas or engaging in some popular “ministry” without looking out of place. If you choose your cause carefully, you can appear really cool and have the added bonus of no nasty side effects. Our young people are encouraged to abandon their communities, whether they feel called or not, and embark on a faraway journey (must be overseas or it’s not regarded as a proper mission trip), in some benign cause where they will experience a wonderful awakening that can’t be experienced in their own country – apparently. The new wave of kids heading overseas to find their inner SJW is concerning because the cause is sometimes misguided, having unintended consequences and lacking depth of what true missionary work is. Like Hollywood celebrities who love to be seen with refugees and visiting African orphanages, the energy required to be a Claytons SJW is minimal and promotes them as a compassionate person, an indispensable item for anyone lacking self-worth. Like Claytons, there are no side effects to the socialist Kool-aid. They can drink deep and go home to adoring fans who are none the wiser thinking they are really, really nice people. The church SJW’s it seems, choose cruisy numbers flitting off to various utopias, often ignoring closer-to-home issues like the myriad of problems and needs within their own communities. Just ask children’s Sabbath school teachers or Pathfinder leaders who are crying out for volunteers to help with the tiresome task of running classes. Usually these important positions are left last at nominating time and are hard to fill because executive roles are dealt with first, sucking up all the talent. Kid’s leaders in an average church will tell you of how desperate they are to get someone, anyone, to just come and help out. But nobody wants to be hidden away in a back room slaving in a thankless role. If we’re honest, most Adventist communities have people or families who have been unfairly dealt with by a pastor, leaders, power groups or even a Board, and are just as much in need of support as a refugee in a remote village of Syria. But for the emerging SJW these church issues are taboo because everyone knows the repercussions from past experience of those who stuck their necks out and got creamed. We watched on and saw how the church dealt with this one or that one and sympathise, but it moves us not from our comfortable pew to take up their cause and get a smear as a result. No, it’s much easier to head off to Vanuatu as a voluntourist and become an actor in our own play where the rewards are guaranteed happiness with a victory parade on arrival home. One of the main crisis that has emerged in the 21st century is the rise of Islamic extremism. This has caused a division in the west between those on the right who see the problem as Islam vs SJW’s on the left who are fearful of being tarred racists. A Clayton’s SJW will only condemn something when it’s safe to do so. They are ok condemning paedophilia and other manifestations of child abuse because there is enough public groundswell to ensure no repercussions. They can by virtue signalling do their bit to stamp out this “evil scourge” on society while at the same time fill an inner need to do something “courageous.” These new-age socialists will give Catholic priests a hard time but you can hear crickets chirping when it comes to confronting Islamic clerics and the Muslim culture for their abuse of women and children. The Claytons SJW knows that this arena is a minefield of danger to one’s reputation and may leave them exposed, so they are mute on Islamic atrocities. It’s even considered hip to have a Muslim friend making the SJW look cool with the added bonus of dodging that terrible word – Islamophobia. I find this very hypocritical. This is so blatantly obvious concerning the current European migrant crisis. Normal intelligent non-Christians have spotted the inconsistencies with so-called "refugees" and are likening it to an invasion. They see it for what it is, identifying them as “country shoppers” because they bypass alot of safe countries in order to get to the best welfare states of Europe. Most of the migrants are also young men of fighting age and it has been estimated that around 75% are men with the remaining being women and children. Most of my countrymen in Australia look on in disbelief as European leaders commit cultural genocide allowing their once peaceful countries to become cesspools of violence and terror. There are now massive protests in France, Germany and the Netherlands against their governments for having such a foolish open slather policies on immigration, turning their lands into Middle Eastern ghettos. And who are the ones bleeding all over the place crying on the streets holding candle light vigils at demonstrations saying "let them in"? This is what gets us deserved ridicule when our inner SJW wants to appear nice and compassionate, but it turns normal thinking people off. Go to any social media page and see the anger vented towards Christians supporting illegal immigrants. Many shake their heads in disgust because all they see is lunacy. Non-Christians with common sense watch on in disbelief while Claytons SJW’s support things like transgenderism, homosexuality being taught in schools, gay priests or whatever else provides them with a feel good fix. In certain discussions around these issues, I sometimes avoid telling people I’m Christian for fear of looking like an idiot. Average people are even rubbishing our own Sanitarium Company because it pays thousands of dollars each year in Halal tax to the corrupt peak Islamic body in Australia (AFIC), who have connections to terrorism and are under investigation for missing millions. I feel embarrassed to let some people know I’m an Adventist because they rubbish the church so much about this. It makes me think Jesus’ words, "for the children of this world are in their generation wiser than the children of light" (Luke 16:8), applies directly to the SJW movement in our church. I came to cast fire on the earth, and would that it were already kindled! I have a baptism to be baptized with, and how great is my distress until it is accomplished! Do you think that I have come to give peace on earth? No, I tell you, but rather division. For from now on in one house there will be five divided, three against two and two against three. They will be divided, father against son and son against father, mother against daughter and daughter against mother, mother-in-law against her daughter-in-law and daughter-in-law against mother-in-law" (Luke 12:49-53). The Claytons SJW avoids conflict like the plague. Focussed solely on having a great time with an overriding need to fit in without too many waves is their goal. Offending nobody is their lifelong ambition. Their Social media pages reflect this with hundreds on their “friends” lists, only allowing posts that are sensitive and caring but removing or blocking anyone who dissents or appears negative. Their imagined utopia is a façade for a selfish existence where the only person that matters is themselves and their own inner needs for personal fulfilment. So next time you’re at a party, have the guts to stand out and say you don’t drink. Pretending only leads to eventual disappointment, and to many friends who will one day abandon you when they see behind the illusion. Danny Bell writes from Tasmania, Australia.